Did you know that air has weight? In fact, a large amount of air can be very heavy. Here’s a way to demonstrate the weight of air. You should do this with the help of an adult so you don’t burn yourself. Get an empty soft drink can. Put about a quarter inch of water in the can. Put several inches of water in a sink or large pan. Set the can on the burner of a stove and bring the water to a full boil. Let it boil for about a minute, but be careful not to let all the water boil away. 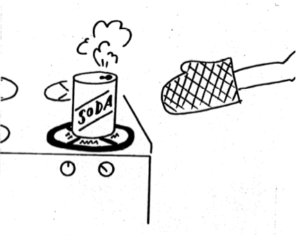 With a large pair of tongs or hot pads, remove the can from the stove. Don’t touch the can; it’s very hot! Place the can upside down in the sink or pan of cold water. The can should be instantly crushed! When the water boils, the steam forces the air out of the can. When the can is placed in the cold water, the steam changes back into liquid water. This leaves a vacuum in the can. The can crushes because of the weight of the air outside the can. The total weight of the air can be as large as 700 pounds! The weight is so large because we live at the bottom of an atmosphere that goes up many miles. All that air isvery heavy and presses down on us all the time. Why aren’t we crushed just like the can? Why does a balloon filled with helium rise? Have you ever gone down deep in a swimming pool and felt the pressure? That’s because of the weight of the water above you. Do you think a fish notices the weight of the water?